Gripped by a frigid winter, and plagued by a continuing military occupation, the city of Boston sits balanced an the edge of a blade. Tensions between the citizenry and the British troops garrisoned in the town have reached a critical point. Young street toughs harass the soldiers; laborers and military men threaten one another in the lanes; and merchants who violate the non-importation agreements set in place by Samuel Adams and his fellow Sons of Liberty face ridicule, vandalism, and dire warnings of worse to come. Ethan Kaille, thieftaker and conjurer, has little choice but to work for these merchants when they seek help. Jobs are scarce, and his rivalry with the lovely and dangerous Sephira Pryce continues to take a toll on his income. So it is that he is in the streets when a demonstration in front of the shop of a non-compliant merchant turns to violence and then to murder. A young boy is killed by an errant rifle shot, and his death proves to be the spark that ignites a series of conflagrations in the city. Arguments turn to brawls; harassment turns to rioting. The thing is, Ethan is certain that a magical spell compelled the wielder of the rifle to pull the trigger. And his spectral guide is certain that the spell came from Ethan himself. Now Ethan must find the powerful conjurer who is using him and his magic to set off violent confrontations all over the city, and he must do so before this madman brings tragedy to all of Boston, and takes the lives of the people Ethan loves most. Dead Man’s Reach is the fourth and (for now) final volume in D.B. Jackson’s historical urban fantasy series, the Thieftaker Chronicles. Combining elements of traditional fantasy, urban fantasy, mystery and historical fiction, the Thieftaker books are sure to appeal to readers who enjoy intelligent fantasy and history with an attitude. 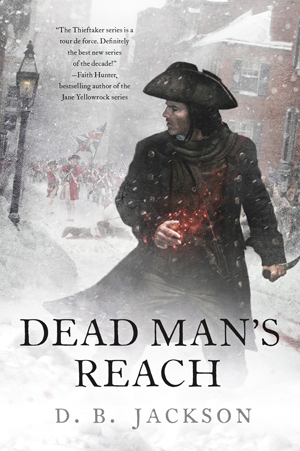 Dead Man’s Reach is available in hardcover and ebook formats, and can also be purchased from Audible as an audio book.